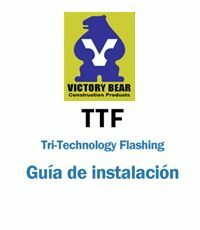 Victory Bear’s “TTF” – Tri-Technology Flashing, is a state-of-the-art weep hole/flashing system for brick veneer construction. For commercial and residential use, TTF not only keeps your property dry, it eliminates water that collects behind brick veneer exteriors faster than conventional weep hole systems. TTF’s base unit easily assembles with our one-piece quick connectors. Corners and steps are pre-manufactured and connect directly to the base unit. The flashing snaps directly to the base unit, forming a watertight seal. 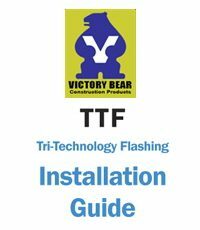 TTF installs in almost any kind of weather condition, eliminating costly rain delays. The easy installation process reduces the total man-hours required, thus becoming more cost effective. TTF eliminates standing water between the brick and framing and helps reduce the chance of mold. By keeping the weep holes under and behind the brick, our patent-pending design allows water to exit freely. Our Victory Shield prevents excess mortar from blocking the weep holes by keeping the excess mortar above the water gutter and weep holes.